Peel, clean, and de-vein the shrimp. Season with salt and pepper. Dip each shrimp in the beaten egg and coat with the shredded coconut until completely covered. Heat the vegetable oil in a frying pan over medium heat. Fry the battered shrimp until they are crispy and golden. Once removed, let any excess oil drain off over a paper towel. Have the bacon ready- cooked and diced. Separately, form small balls with the goat cheese and roll some in white sesame seeds and a few in black sesame seeds. Save in the refrigerator. In a bowl, combine the lettuce and cherry tomatoes. Season with salt and pepper. For the dressing, mix the mayonnaise, condensed milk and mustard. 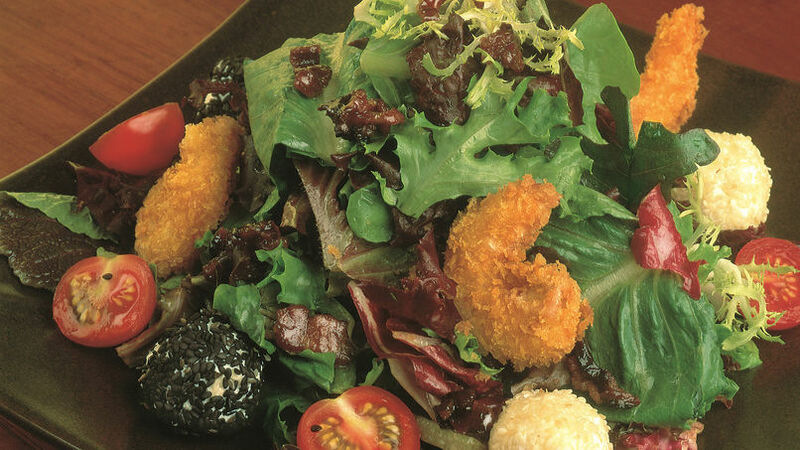 Finish the salad by placing the battered shrimp on top, along with the bacon and sesame-covered cheese. Dress with the mayonnaise sauce and serve immediately. You can substitute the shredded coconut for cooked quinoa. Wrap the shrimp in shredded yucca. Yellow sweet potatoes or wonton wrappers work well too. A spicy marmalade makes a perfect dip for accompanying shrimp if you don’t want them on the salad. What a tropical and delicious combination shrimp and coconut make- especially when the shrimp are covered with a crispy coconut crust! One of my favorite salads, created by Chef Jimena Llosa, was the inspiration for this exquisito dish.